Exploring themes of light and shadow, translucence and opacity through her paintings, drawings and prints, Hermione Carline imbues her work with an immersive and atmospheric quality creating pieces that are abstract but firmly rooted in the material world. She has created her own unique style through her application of multi-layers of opaque and translucent colours and her use of hand-cut paper stencils. Hermione was born in Hampstead to a family of artists. Paintings by her parents and ancestors, Carlines and Spencers, lined the walls, along with collections of African masks, antique toys and various curiosities. This inspiring atmosphere empowered her, enabling her to forge her own artistic path and explore beyond the traditional parameters she had inherited. After completing her masters at the Royal College of Art, Carline worked as a textile designer, co-founding design studio, The Collection; where clients included Pierre Cardin, Christian Dior and Ralph Lauren. These earlier experiences in designing and interiors have informed much of her current work. In addition to her art practice, art education has played an important part in her life, earlier experience as a visiting lecturer at Brighton College of Art led on to her establishing her own teaching business, Art-Atelier, inspiring adults and young people with her original and individual style of teaching. 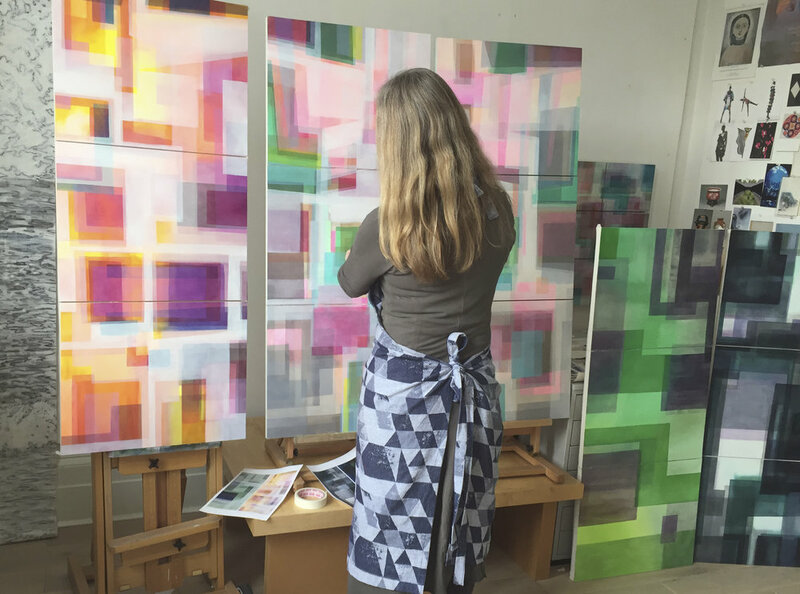 She has recently collaborated with Claridge’s on a series of paintings for their new refurbishment and has exhibited regularly in London with The Other Art Fair and Gallery Elena Shchukina in Mayfair. She has been featured in The Sunday Times - Time and Place, Hedge magazine - Best in Show, interviewed by Artwork Wednesdays and selected as featured artist in Reyker magazine. She has won prizes for drawing and mixed media including Winner of the Pure Arts prize 2014 and 2015.